Resting Takes a Lot of Work? A month ago I set off on an 11-hour drive to speak at a Writing Retreat that my friend Andi hosts each year. The prior three weeks had been an all-out sprint to keep up with client projects while my wife was on a research trip, release a book, prepare for the retreat, and catch up on client work a little more. This was the final stretch of a month-long sprint, and my mind and body were BUZZING. Energy, stress, anxiety, and who knows what else left me feeling desperate, sad, and a bit unhinged. How in the world could I speak about writing without crushing your soul at this retreat in a state like this? I needed silence: a lot of it. I breathed deeply. I centered on a prayer word. I let go of any thought that wasn’t related to avoiding trucks and finding Dunkin Donuts coffee. Starting north of Nashville, I sat in silence for long stretches all the way across I-40. When I reached Knoxville, I had listened to a few short podcasts (thanks to Anne Bogel’s “What Should I Read Next”! ), but the unsettled buzzing in my mind continued. Over the rolling hills and mountains of Virginia I continued to breathe deeply for the entire stretch of I-81. Finally, turning toward Charlottesville, I sensed something settle. Since I was arriving about an hour later than I had intended, I passed up a scenic overlook along the highway. I immediately regretted this. The mountains were spectacular at this pass. Why was I so determined to pass up beauty for the sake of a clock? I just about jumped out of my seat when another scenic overlook showed up five miles later. I pulled into the lonely rest area and just about fell over with the silent majesty of these mountains. This thin moment before the mountains was its own gate of heaven, delighting in creation. Nothing particularly spectacular or spiritual happened. I had found my center, a place of rest in God that wasn’t at the mercy of my circumstances so that I could enjoy what was before me. How many times in the past have I been running on empty or burned out, but I’ve pushed on, believing that I just needed to get through it? How many times have I passed up beauty, rest, and restoration because I didn’t understand the value of silence or finding my center? How often have I missed the silent beauty of God because I didn’t know how much work it is to be still and know that he is God? Contemplative prayer has taught me about the paradox of resting in God. I don’t naturally choose rest, and I honestly need to work at resting. I have to fight for my rest by choosing silence when everything in my body craved distraction and noise. Resting in God takes practice and intention. What Would God Shout at You from a Cloud? In the Gospel of Matthew, there are two instances where a cloud appears over Jesus and God shouts two brief, identical messages. I have often wondered what God would shout at me in a similar situation. Honestly, I tend to think God would shout negative things at me. I imagine God telling me to stop doing something or to do more of something. In either case, the message would focus on the ways I’m falling short and have been inadequate. I have struggled to imagine a loving and merciful God. It’s much easier to imagine a God who is either disappointed or really, really angry. Bringing up this disappointed/angry image of God with people tends to strike a nerve. What would God shout at you? stop obsessing about your body image! help more people in need! go to a different church! We can’t imagine that God the Father is for us and loves us. We can only imagine God showing up in a cloud and telling us to get our acts together, to start doing something different. God the Father isn’t typically imagined as being on our side. God the Father is somehow joined with Jesus in the Trinity but remains disappointed in us and in need of a blood sacrifice to make us acceptable in his sight, working out a loophole in his infinite holiness and justice. On both occasions, God the Father affirmed the Son. On the first occasion Jesus had not even started his ministry. I have tended to write off the significance of these moments between the Father and the Son. However, I now think that this was a big mistake on my part. Through the ministry of Jesus and our union with him, we have a new way of thinking about God. If God is our Father through our union with the Son, then it isn’t far-fetched to say that God’s first thought of us is love and a desire for deeper union with us. God desires to heal, redeem, and restore his children. Failing to believe that I am a child of God is the most important obstacle for prayer. Once I believe that God loves and accepts me like Jesus is loved and accepted, prayer becomes a moment to rest in God’s love rather than a game of hide and go seek with God or a proving ground for my spirituality. For years, I doubted God’s love for me, and my struggles with prayer served as validation for those doubts. Beginning with the foundational teaching of God’s love and acceptance for his children made it possible to rest in God’s presence and to trust in his love for me. I was finally able to participate in the silence of contemplative prayer that seeks to lovingly gaze at and adore God the Father. Contemplative prayer relies on resting in this love as the first step in prayer, letting all other distractions fall away in order to be still in God’s presence. Imagining a God who calls down to us with loving messages before we’ve done a single thing can revolutionize how we pray. This was the God that Jesus wanted to reveal to us, and this is the God that we can pray to when we turn to him in silent adoration. Allow me to reveal just how Protestant I am. I’ve studied the Gospels closely and intensely for the majority of my life, but I rarely made any connections between Jesus and monks, starting with the fourth century desert fathers, right on through the present day. Jesus was out in the public eye preaching sermons and discipling people, right? When I became more charismatic, I started tacking on “healing people” to Jesus’ list of activities. What could Jesus possibly have in common with monks who hid in the desert, took vows of silence, and wove baskets or brewed beer (depending on the century) in their free time? Wait, that’s starting to sound a bit like a monk. Mind you, there are all sorts of monks. 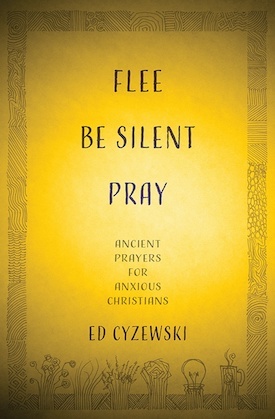 Some are more chatty, some are more handy, some are more interested in preaching, and some are more interested in preserving the quiet, contemplative prayer practices that have been passed down by the historic church. I can’t imagine any Protestants saying that Jesus was particularly “monastic” in his practices or his ministry. I can, nevertheless, see the common threads between Jesus and the monks. They make a lot more sense when I start looking at the ministry of Jesus. Jesus was kind of like a monk. The monks also make a lot more sense when I remember that they were a reform movement in the line of a long history of reform movements that took to the desert and wilderness. When the prophets called Israel back to God, they often hung out in the wilderness. When John the Baptist began preaching about repentance… wilderness. When Paul needed to figure out the Messiah in light of Jesus… wilderness. As Christianity rose in prominence, the monks recognized that the empire’s power and the influence of the clergy could become extremely toxic. They also fled the pleasures of the city, and even if Protestants would like to critique some of their negative associations with the body (Hello there, early church cultural captivity to Platonic philosophy! ), we can sort of get it today. They wanted to remove as many distractions from the pursuit of God, and as Christianity grew in power and influence, they also wanted to avoid the temptations of church-based power. Jesus didn’t go to the extreme of hanging out in a cave 24/7, but the more we look at the way he rejected the power centers of Judaism and any kind of official position within the religious hierarchy of his day, the more he looks like a monk. The monks became a kind of expression of the Christian faith in a particular time and place, so the continuity and differences shouldn’t surprise us. Just as Jesus heard the voice of God loud and clear alongside a lonely river or atop a deserted mountain, the monks actively sought to hear the voice of God by pursuing solitude rigorously. Just as Jesus battled Satan during his 40 days in the wilderness, we have many reports of visitors to the cells of monks hearing them arguing with demons. As a Protestant, I have long considered the monks a different class of Christian. Not necessarily a “higher” class (Hey, I AM Protestant after all), just a different class. They did spiritual stuff and experienced God in ways that I’ll simply never touch, right? As a follower of Jesus, I continue to face the possibility that he was more like the monks than he resembles a lay person like me. He routinely sought quiet moments alone with God and even made great sacrifices in order to make it happen. Jesus modeled the daily pursuit of God within ministry, and he knew deep down to this core that he was God’s beloved Son, a Son that pleased God the Father. The monks set off to their cloisters in order to uncover this mystery for themselves. How could the God of the universe love them so deeply and fully? They dropped everything in order to find out. They were so committed to this pursuit of God’s love that they didn’t want to risk confusing the praise of church leaders with the acceptance of God. I’m still a Protestant, but I’m one of the growing number of Protestants who recognize that the spiritual practices of monks are deep, true, effective, and needed. The monks know a great deal about the presence and absence of God, the intimacy of Christ, and the ways that daily attentiveness to the pursuit of God can reorient our lives in ways that we can hardly touch through hours of diligent Bible study and historical-critical exegesis. I’m not a monk, but I kind of want to pray like one because the monks were kind of like Jesus. I’ve spent so much time worrying about whether or not God exists that I overlooked a more important question. If I believe that God exists, do I believe in a God that I would approach in prayer? Another way to ask that would be: If I believe in God, do I believe in a loving, merciful God who wants nothing more than for me to pray? Or do I let my imagination create images of an angry, violent, and petty God who is waiting for me to finally mess up enough to justify banishing me from his presence forever? By imagining a God who could take me or leave me, waiting to strike me down, or to cast me away at the slightest infraction, I made it extremely hard to pray. If I can’t imagine God liking me, let alone loving me and seeing me with compassion and mercy, it’s awfully hard to begin to pray. The LORD is full of compassion and mercy, slow to anger and of great kindness. I don’t know how to create a theological system that seamlessly accounts for these stories and comfortably fits them in with the many verses in the Psalms and prophets where God is described as merciful, compassionate, full of love, and loving for his people like a jilted lover. Here’s what I do know: the people who seek God in prayer have found more love, mercy, and compassion than they ever would have guessed. When the mystics write about the presence of God, there is awe and even a bit of fear at times, but God is love, compassion and mercy. The people who have dedicated their lives to prayer overwhelming reveal that the God we seek is the kind of God we would want to seek. That isn’t to say that our faults or sins aren’t a big deal. Anyone who believes in the cross and resurrection would recognize that these are important problems that God himself has set out to resolve. The point for me is not minimizing my faults, it’s seeing the largeness of God’s love, mercy, and compassion. My mistake wasn’t underestimating the seriousness of sin; it was underestimating how deeply God loves us. Over and over again in the Gospels, I see Jesus telling people that God is more loving and merciful than they expect, that more people are welcome than they suspect, and that the supposed barriers between people and God are actually not holding anyone back. Perhaps the greatest struggle for Christians today isn’t believing God exists, it’s believing that God is merciful. We do ourselves no good if we believe in a God that we fear, a God we dare not approach, or a God who is so terrible that we fail to open our deepest fears and pains to him. In the vast reserves of God’s love and mercy, there is room for us to come as we are and to seek healing and restoration. The greatest obstacle to God’s mercy is believing that it exists and applies even to you and to me.